And yet it happened during a party at a popular village hall. 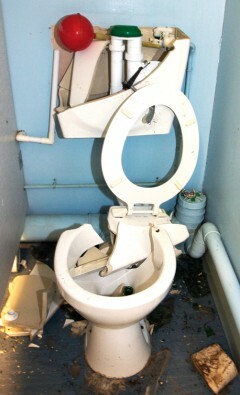 And this wasn’t the only damage at Hopwood Community Centre, apparently after a teenage birthday party was gatecrashed. Other toilets were wrecked, leaving water leaking across floors, a fire door was kicked in, heaters were torn from walls and fire extinguishers were let off. Outside, broken glass was left in the goalmouth of the football pitch meaning children’s matches could not be played that weekend. This was just before Christmas, and party bookings had to be cancelled leaving many people disappointed. The hall was back in use for Alve­church Parish Council’s January meeting there, but the events had left a bitter taste. Coun Caddick said he felt it was essential that the council reassessed the terms of hire at the hall to try to prevent it happening again. As The Village went to press West Mercia Police said their investigation was continuing and appealed for further witnesses or anyone involved with the party to call on 08457 444 888 or ring Crimestoppers anonymously and free on 0800 555 111.